DynaGrace Enterprises, a WOSB, professional services company has been awarded the GSA Schedule 66 - Scientific Equipment and Services Schedule Contract. The first women-owned firm in Utah to be a vendor on that prestigious GSA schedule. DynaGrace Enterprises helps people breathe cleaner air by providing products and services for monitoring respirable dust particles and visible emissions. 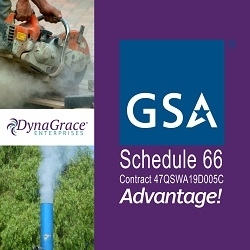 Salt Lake City, UT, April 10, 2019 --(PR.com)-- DynaGrace Enterprises, a WOSB, professional services company has been awarded the GSA Schedule 66 - Scientific Equipment and Services Schedule Contract. The first women-owned firm in Utah to be a vendor on that prestigious GSA schedule. It’s more than Dust. The employee who works in a dusty environment is exposed to a deadlier form of dust, silica. The average person is also exposed to a massive amount of air pollution that you can see with the human eye. DynaGrace Enterprises helps people breathe cleaner air by providing products and services for monitoring respirable dust particles and visible emissions. “This federal government contracting vehicle enables us to reach more occupational health and safety managers as well as those agencies concerned with worker safety and air quality regulation and compliance,” stated Linda Rawson, President and Founder of DynaGrace Enterprises. The respirable dust products surround the Nanozen DustCount 8899, a real-time, wearable, respirable dust monitor. Instantaneous reporting makes compliance with OSHA Respirable Crystalline Silica standard easy. The Nanozen DustCount 8899, a real-time, wearable, respirable dust monitor detects air particulates down to a microscopic level in real-time. OSHA has recently changed the Respirable Crystalline Silica Permissible Exposure Limit (PEL) to 50 mg/m3 for 8 hours and the Action Limit to 25 mg/m3. Employers need to evaluate and control the exposure limit for their employees. One way to do that is to have a worker wear the DustCount for 8 hours and obtain the Total Weight Average (TWA). The rugged DustCount fits into a vest pocket or clips on a belt. The results can be analyzed real-time and downloaded at the end of the shift. The filter is then sent to an AIHA approved lab to be analyzed for silica levels. The second product line surrounds visible emissions and offers a Laboratory Information Management Systems (LIMS) called Digital Opacity Compliance System (DOCS) by Virtual Technology LLC out of Arizona. The system can determine plume opacity from smoke, soot, and visible dust. Some of these are necessary, but the software helps determine how much is too much. The software ensures EPA Method 9 compliance and EPA Method 22 for the frequency of emissions. Scientific professional services are also available including Data Security Analyst, Software Systems Engineer, Technical Writing and Editing, Technical Support and Visible Emission Consulting. Customers can learn more about DynaGrace Enterprises by visiting the company’s website at DynaGrace.com or by calling the company directly at 888-676-0058. DynaGrace Enterprises will be at the AIHA conference in the Nanozen booth #1502. Nanozen DustCount 8899, a real-time, wearable, respirable dust monitor. Instantaneous reporting makes compliance with OSHA Respirable Crystalline Silica standard easy. The Nanozen DustCount 8899, a real-time, wearable, respirable dust monitor detects air particulates down to a microscopic level.